The expectant crowd had started coming in an hour earlier, the Mercator Servery, bedecked with decorations was unusually festive, was buzzing with excitement; for it was the night of the Indian Country Information Day and everybody wanted to make sure that they got a front row view of the proceedings. The audience were given an official welcome by Vikram and Nicole, the Mercator college masters. The fact that the Pakistanis on campus had helped in the organization of the Indian CID came in for special mention. And then it was time for the show to begin. 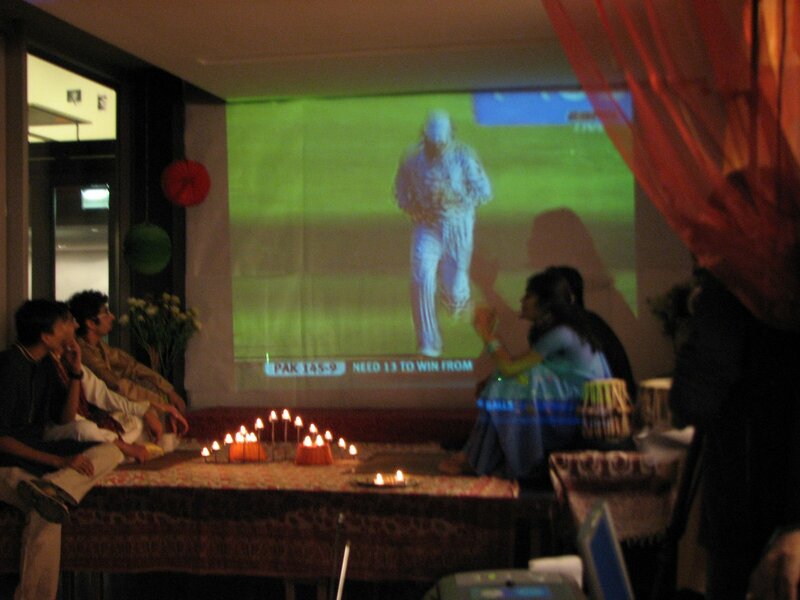 The Indian CID, themed on an Indian wedding, began fittingly with the clip of a cricket match. Time to show everyone how mad Indians are about cricket. The groom, ( played by Devashish) in stead of attending his wedding was engrossed in the match along with his entire family. Only when India won the match did they all proceed to the wedding. And then, Jensen gave a presentation on the sports played in India which apart from cricket also include hockey, polo, kabaddi, chess and tennis. Meanwhile, the bride’s family was anxiously waiting for the groom’s family and they arrived amongst much singing and dancing. And when the bride (played by Neha) finally arrived flanked by her sisters the groom was so captivated by her beauty that he took a walk down the memory lane thinking of the first time they met. He soon snapped out of his dreams and the “pandit” (An Indian priest, played by Rahul) continued with the wedding rituals. 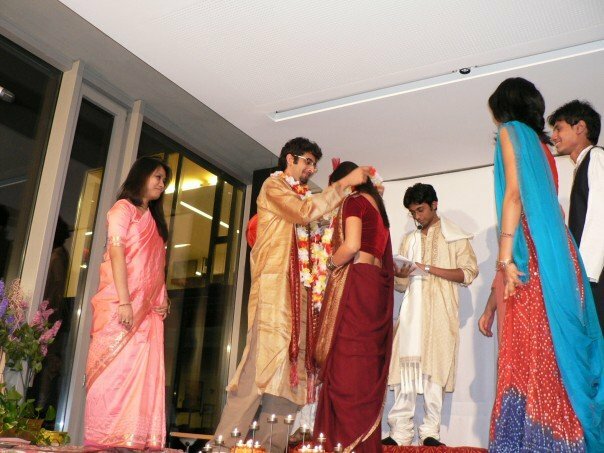 The bride and the bridegroom exchanged garlands symbolizing their mutual acceptance of each other. And then lightning struck. 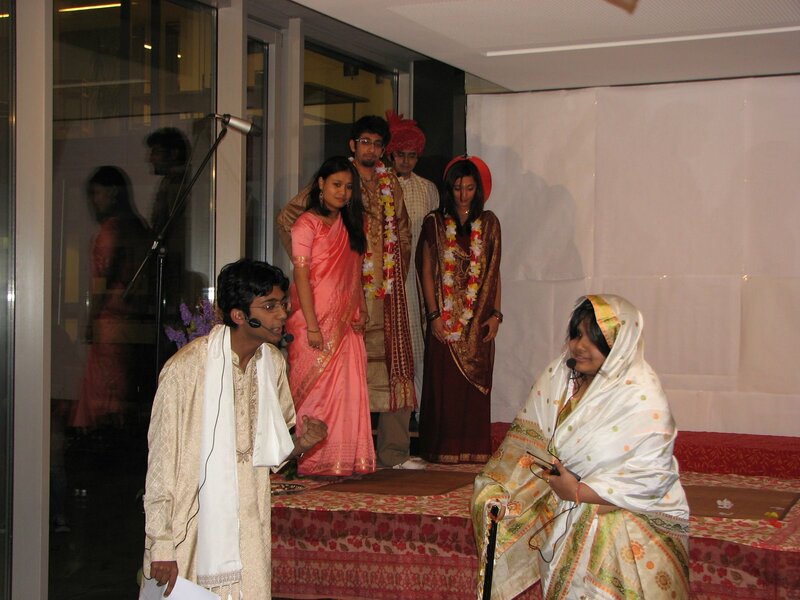 The bride’s grandmother (played by Radhika) was infuriated that her granddaughter was marrying someone from another caste. The pandit managed to placate her and also gave us information about the evils of the Indian caste system and its historical background. The Granny was soon as calm as a lake and even agreed to bless the couple. Then Deepika told us about the secular India, about the 7 different religions practised in India, and about the numerous festivals that the country as a whole celebrates irrespective of religion. Vilasini, Charitra, Swetha, Sheetla, Ravi, Anneysha and Ankur wanted to discuss where the couple should go for honeymoon and thus we were introduced to the various scenic locales of India, from the Royal Rajasthan to the Romantic Agra, from the backwaters of Kerela to the tea gardens of Darjeeling, from the serene beaches of Kanyakumari to the party all nights in Goa and then to the only paradise on earth – Kashmir. 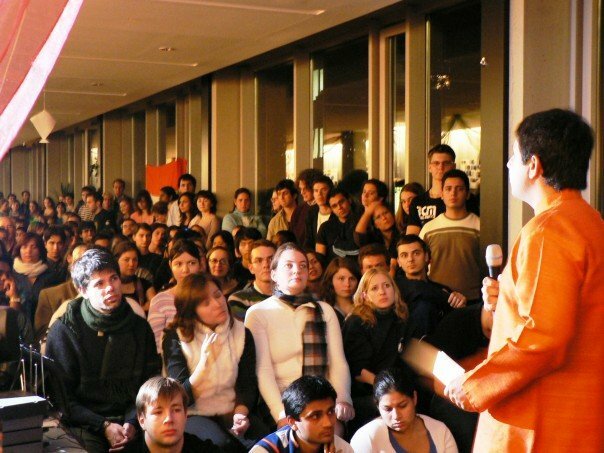 And for those wanting to travel to India, there was interesting information from Tanmay who informed everyone that there are more than 1500 languages spoken in India and it might not be easy to communicate with everyone you meet. Roy, Hozefa and Pranjal then decided to challenge the triumvirate of Ananya, Anneysha and Swetha to a dance session and what followed was a fun filled dance performance to some groovy bollywood tunes. 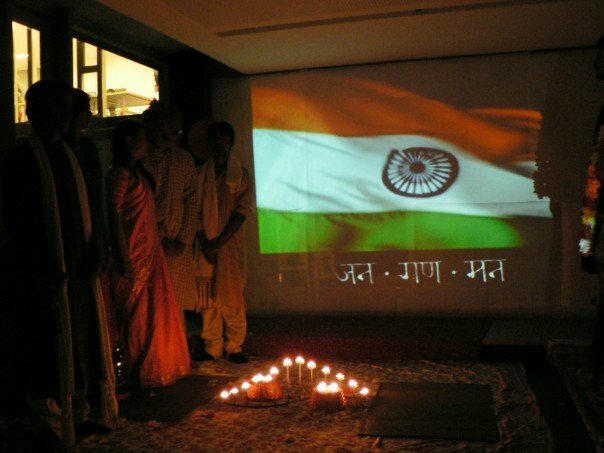 But Indian Music is not only about Bollywood and we were reminded of that by Radhika and Shikhar who informed us about Indian Classical Music and the various dances of India, both classical and folk. 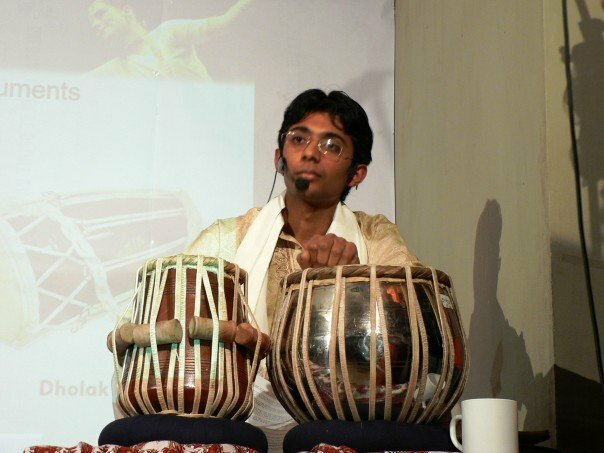 Rahul chipped in with a performance on Tabla, one of the most popular Indian Classical Instrument. Roy, Dipesh and Vilasini had some interesting information about technology and science in India which you just can not find on wikipedia. Everyone was amused by the concept of “jugaad” – a quick dirty fix. And then it was time to go back to the wedding. The pandit over the “pheras”, the most important ceremony in an Indian wedding where the bride and the groom exchange seven vows which declare then husband and wife. There is also the ceremony of “kanyadaan” where the bride’s father (Mitul, here) gives his daughter in marriage to the groom. But there was something missing, and it was the rise of India as an economic power. Mitul gave a detailed presentation on all aspects of the Indian economy, with the take away message to all other countries – Beware. We are coming!. With the pheras over, so was the wedding. 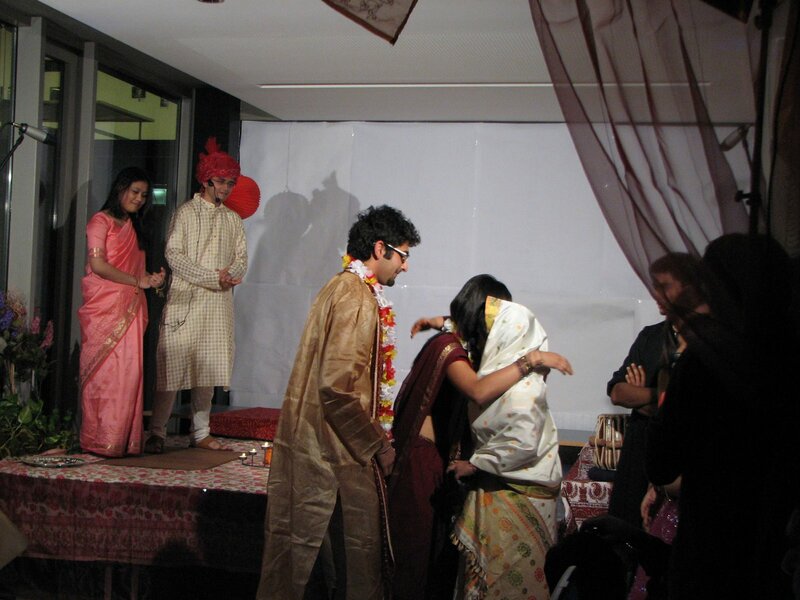 And it was time for the “vidai” where the bride;s leaves her father’s house to go to her new home – her husband’s house. Her parents and family bid her a tearful adieu and the curtains came down on what was a roller coaster ride through India and the life of Indians. But wait, do not go away yet, for it is time for the most awaited part of all CIDs – food. The culinary delicacies prepared by the Indians, with help from some of their Nepali’s friends, were appreciated by one and all if the queue at the food counter was at any indication of this fact. 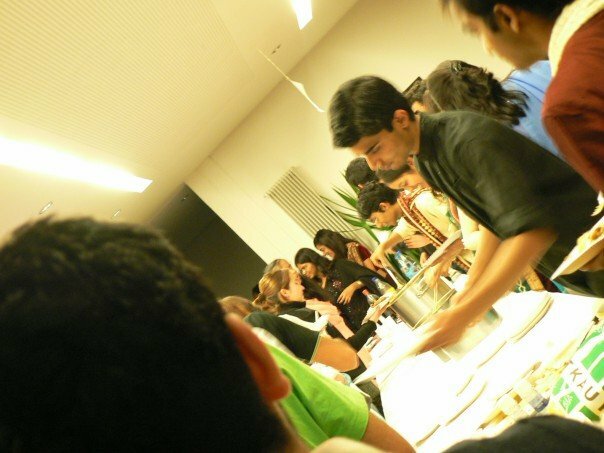 Though nearly everyone seemed in a hurry to get a glass of water or the sweet and delicious “payasam” prepared by the college masters after the spicy food, yet they came coming back for second helpings. All in all, it was a wonderful night, and the Indian community can be pleased of the fact that all their hard work paid off and they managed to stage a successful CID. 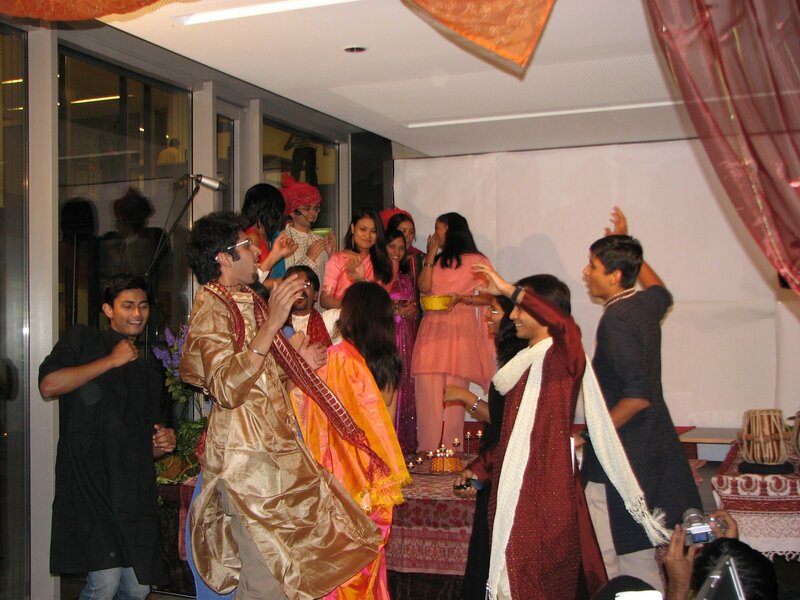 And all this was realized on stage through the technical expertise of Prashant, Deepu and Kevin.